I apologize if this image offends anyone. But I find it beautiful and I wanted to share. My husband’s 94-year-old grandmother died last week after a long battle with cancer. For the first year-and-a-half she did well, a round of radiation with my mother-in-law as her live-in caregiver and nurse. After her birthday this year (July 4), she retired to her bed and did not leave her bedroom again. With the help of hospice nurses, my mother-in-law cared for her as if she were a newborn baby. I wish I could say it was peaceful as her obituary claimed, but the last two weeks were not. I will spare the gruesome details and say only that I now understand how zombie legends started. Apparently, my grandmother-in-law’s heart kept going even when her body had begun serious decomposition. My mother-in-law had asked for three pink roses tucked into Nana’s hand– one for each of her three great-grandchildren (all girls, the other two are in their twenties). The funeral director knew Nana well and slipped a peppermint into her fingers as he remembered her always having a hard candy to share. I found so much beauty in that day. The sun-drenched October day turned out perfect, sandwiched between cold, rainy days. 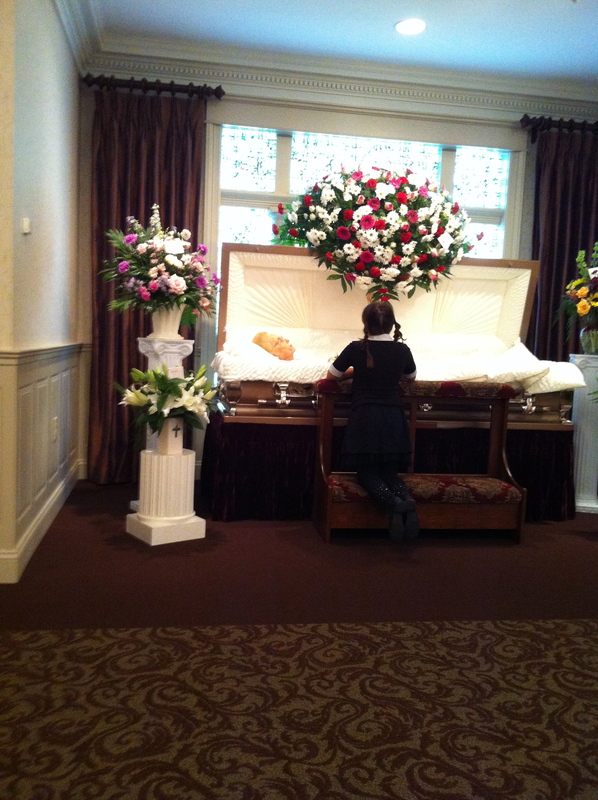 My daughter did such sweet things, like helping her aunt arrange the blankets around Nana before they closed the casket. But this photo summarizes it for me: My darling baby, kneeling before her great-grandmother for a farewell, using those quiet moments before the public calling hours. Yes, you can see the body, but it’s almost indistinguishable. Bathed in light with color from the flowers. It was a peaceful moment.